UNC is a Level 1 trauma center, meaning that we are able to offer broad, comprehensive care to patients who require emergent trauma care throughout the state. 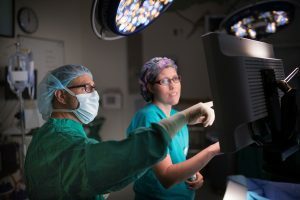 A board certified or board eligible trauma surgeon is always in the hospital to assess trauma patients who arrive through our emergency room and triage those with brain or spine pathology to neurosurgery. Patients with diffuse cerebral edema, intracranial hemorrhage or brain contusions are then monitored by the neurosurgery team and when necessary may proceed to the operating room for evacuation of a hematoma or decompressive craniectomy (a surgical procedure in which a portion of the skull is removed to alleviate pressure on the brain from swelling). Patients sustaining fractures of the vertebral column or spinal cord injury are also assessed by the spine surgeon on call and treated accordingly.